Good morning! Thank you, Lina for that enthusiastic welcome and for inviting me to be a part of this special gathering. We can all feel the commitment and passion you've put into coordinating this program. I want to thank you and all the many volunteers for your hard work and for taking this time to share your love for science and your faith in this very special group of girls. But the rock stars in this room are all of you, the girls of Expanding Your Horizons, Fall 2018 -- give yourselves a round of applause! For some of you, today may be your first encounter with women who have made a career of science and technology. This city is home to a few firsts for me too. It was not far from here that I started my career as a scientist at the Los Alamos National Laboratory. I met my husband rock climbing on the cliffs above the Rio Grande river, and it was here in Santa Fe that I became a mother, twice over. But I couldn't ask for a better reason to be back in this vibrant city, which is also my home when I am not in D.C.
Today, I am proud to serve as the Director of the National Science Foundation. 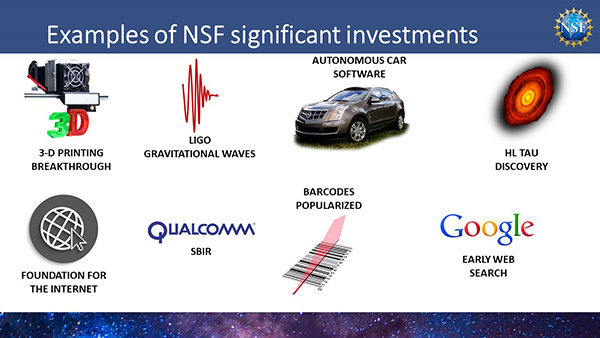 NSF is a branch of the federal government that invests in basic research across all fields of science and engineering. We have a yearly budget that is close to 8 billion dollars. And if you are not yet familiar with our agency, you are probably familiar with the outcome of a few of our investments. Some of your toys or the tools you use at school were made with 3-D printing technology, which NSF helped fund. You know when to carry your umbrella to school because of Doppler Radar, which is used to forecast the weather -- another discovery we supported. None of us can imagine a world without the Internet, but some of us still remember having to go the library to search for information. Today, it is all at your fingertips, in part because of NSF dollars. Many of you may have smartphones already. Those devices use touchscreen technologies; GPS; memory chips; processors; and rechargeable batteries � all of which were made possible by NSF and other federal support. 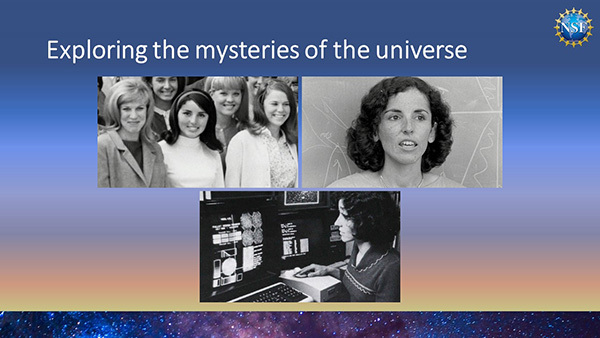 These are some of the amazing reasons why we think of NSF as the place where discoveries and -- discoverers -- begin. Our grants are awarded to researchers like the women you see leading your workshops today. And long before they earned their graduate degrees and Ph.D.s, they were elementary, junior high, and high school students like you. Women like Jennifer Ortiz, who is a PhD student in the Computer Science and Engineering Department at the University of Washington. Jennifer has spent the past few years learning how to help scientists analyze and explore data. 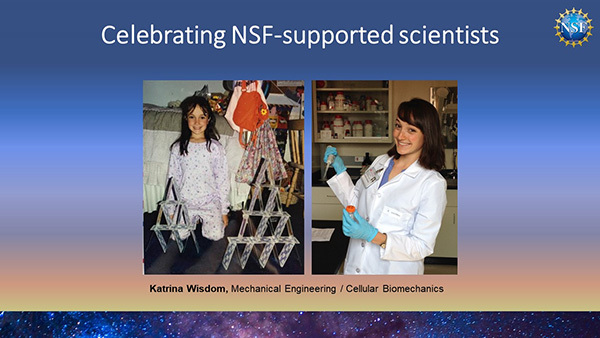 Or Katrina Wisdom, a PhD Candidate in Mechanical Engineering at Stanford University. Katrina is a lifelong ballet dancer, who is using her training as a mechanical engineer to help understand the human body in health and disease. Or researchers like Brittany Allison, who when she was a middle school student like you, loved learning about the first women in space. Now a Postdoctoral Fellow at Vanderbilt University, she is working to make important contributions to medicine and biotechnology. 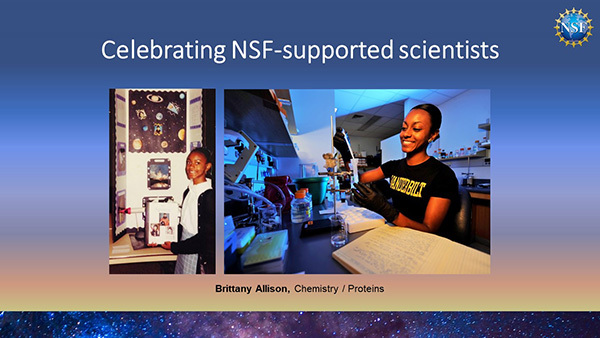 As you can see, NSF-supported scientists come from all walks of life � men AND women of various backgrounds. Some speak different languages at home or celebrate different customs and traditions. The one important trait they all have in common is a deep curiosity about the world around them. As a child, I loved thinking about the cosmos. The night sky was my friend � it made me look up; it made me question what was beyond. But I knew nothing of science as a young girl. Do you know what I wanted to become when I grew up? I wanted to be a detective. 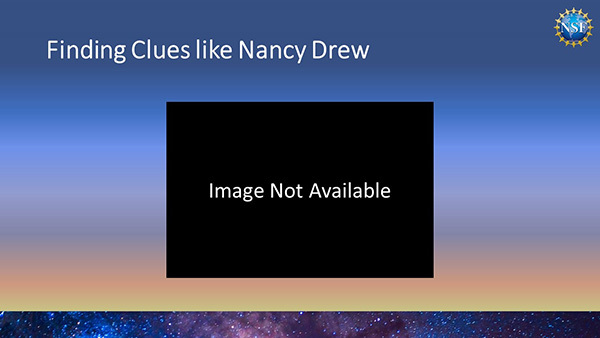 I loved complexity and solving mysteries. I liked finding clues and piecing them together. But I didn't have much time for puzzles as a child. By show of hands, how many of you have younger siblings? Well then you know that often comes with the responsibility of helping your parents take care of your brothers and sisters. I was the eldest of 12 children, so you can imagine how busy I was! Our parents were very active at work and at church, and so to keep our household running, we all had to pitch in. That meant A LOT of chores -- waxing floors, ironing uniform shirts, and even folding cloth diapers! Being busy was such a part of my childhood that it became part of my personality. So much so that today, I like being productive even when I'm relaxing! Truth be told, I don't know any other way! My father � an army veteran who owned a thriving small business -- was very driven too. He had a passion for his work as a contractor and an importer of marble for buildings and a real eye for quality and beauty in his field. Seeing how hard he worked and the standard to which he held himself made a great impression on me. It inspired me to strive toward my own kind of excellence -- which I did, applying myself to my studies. It wasn't long before my parents got accustomed to seeing me earn As, as did the nuns at my parochial school. Soon, it became what they all expected of me, and I worked hard to meet those standards -- not as a burden but as a bar to strive toward. Over time, doing well became the way I saw myself, and that may be the most powerful motivator of all. Ultimately, what you accomplish is shaped most by what YOU believe -- who YOU choose to become. And at any point in your life, today or 10 years from now, you can choose a different route. At the age you are now, my favorite pastime was reading. I studied great writers with deep thoughts, and I delved into my own. I did a science project on the atom; and later in high school, a project on lasers, and I fell in love with physics. In high school, I enjoyed traveling and competing with the debate team, where I learned the importance of public speaking. In addition to academic activities, I also performed in student plays and was a cheerleader. I was even crowned West Covina's Teen Age Miss and was my high school's delegate to California Girl State! When it came time to apply for college, I became the first girl from my high school to be accepted to Stanford University. But back then, girls were discouraged from pursuing an interest in science. There were no events like this one offering us an opportunity to meet women role models in STEM. There were few women majoring in Physics, and no teacher encouraged women to consider becoming scientists or engineers. So, despite my childhood fascination with the cosmos, I enrolled at Stanford University as an English major. While there, I had a yearning to experience new things. So, I chose to study abroad in Florence, Italy. There, I wrote poetry and attended a grand prix race at Lamanza. 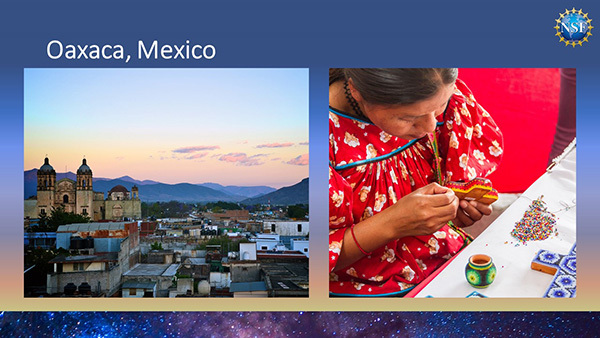 I traveled to Oaxaca, Mexico, where I studied the Zapetec language and wrote a story about the Zapetec women of the Peublo. 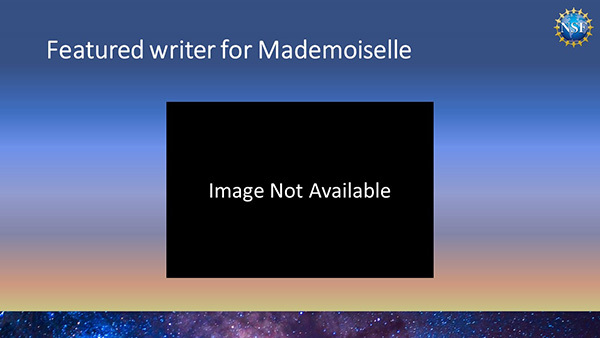 That story earned me a position as a guest editor for a popular college women's magazine called Mademoiselle, which was headquartered in NYC. Being a wanderer, I decided to explore more of the US on my way to New York City, so I went to Vale, Colorado to ski. When the snow melted, I was off for New Orleans, where I lived and worked in the French Quarter. I wanted to experience firsthand all the places I had read about as a child � places that seemed to be beyond the realm of my experience at that time. A lot like what you are doing here today. When I finally arrived in NYC to work for the magazine, we were whisked off to Israel, and my assignment was to write a travel feature about this ancient country for their August issue. I climbed up to the fortress called Masada and swam in the dead sea. We visited Bethlehem and danced on the Golan Heights. It was a culmination of the adventure I'd set out to have. After graduating from Stanford with my English degree, I considered doing graduate work in Anthropology, which is the study of how cultures and society grow. I even got accepted to Stanford's graduate school in Anthropology. But when I saw Neil Armstrong and Buzz Aldrin take those first steps on the moon, my childhood passion for the stars was reignited. Later, I watched a film on neutron stars, which had just been discovered, and that was it for me. I thought there couldn't be anything more exciting. This renewed inspiration led me to knock on the doors of professors at MIT inquiring about doing research in astrophysics. MIT's willingness to take a chance on a young woman with no credentials in astronomy or science was a pivotal turning point for me. That sort of thing just didn't happen back then, but it shows how much a single decision can transform a person's life. And that decision eventually led to my heading off to Caltech to pursue a Ph.D. in physics. As a doctoral student, I made rocket payloads and launched them from the White Sands Missile Range right here in New Mexico. I analyzed satellite data on double star systems, and I uncovered something new about these objects. That discovery landed me my first job at Los Alamos National Laboratory, where I worked for 10 years. The next decade was spent developing my career as a researcher as well as my life outside of science. My husband, Chris and I met and grew very close. We skied and went rock-climbing after work and on weekends, and we even made first ascents. Together, we began to build the family that has anchored me ever since -- adding another layer of fullness and purpose to my life. 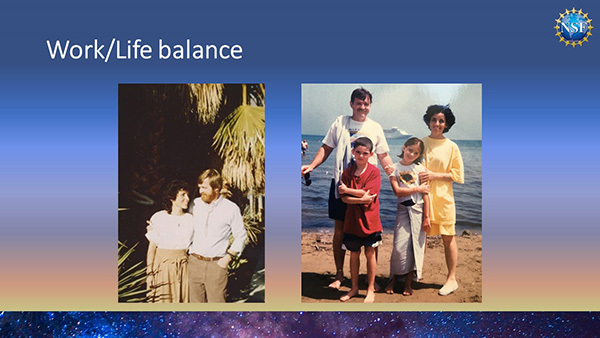 When our children were one and three years old, we moved to Pennsylvania, where I took a position as head of the Department of Astronomy and Astrophysics at Penn State. 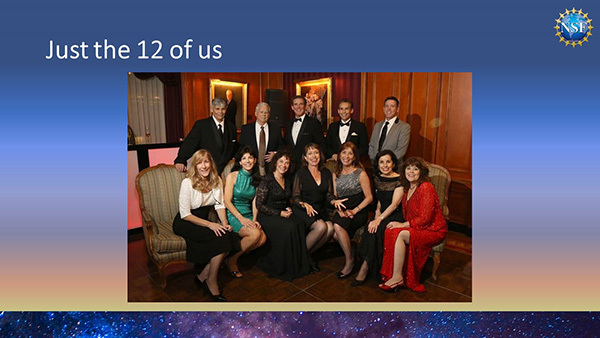 After three years there, the head of NASA, Dan Golden, asked me to serve as his Chief Scientist, and I became the first woman and the youngest person at that time to fill that role. At NASA, I traveled overseas to help expand our international space partnerships. I testified before Congress and spoke at the White House, sharing a podium with then-First Lady, Hillary Rodham Clinton. I visited all the NASA space centers and met many astronauts. We searched for life beyond earth, sending a satellite mission to Mars and the first mission to improve the Hubble Space telescope. To the young girl, who spent hours staring up at the stars, it was a thrilling time. 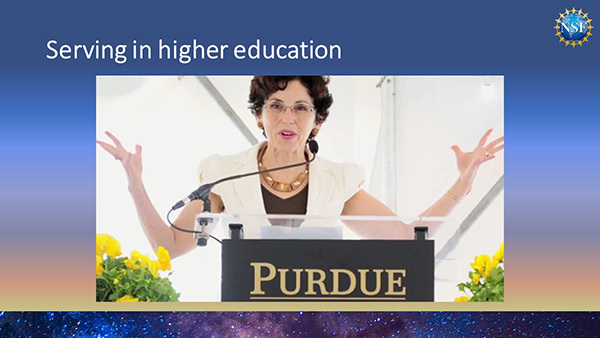 After leaving NASA, I spent several years working in higher education -- first as Vice Chancellor for Research at UC Santa Barbara, then as Chancellor of the University of California at Riverside and eventually as the 11th President of Purdue University. I even chaired the governing board of the Smithsonian, which I loved because I got to know much about all the wonderful Smithsonian museums. I finally made my way to NSF by invitation of the President of the United States and confirmation by the U.S. Senate. 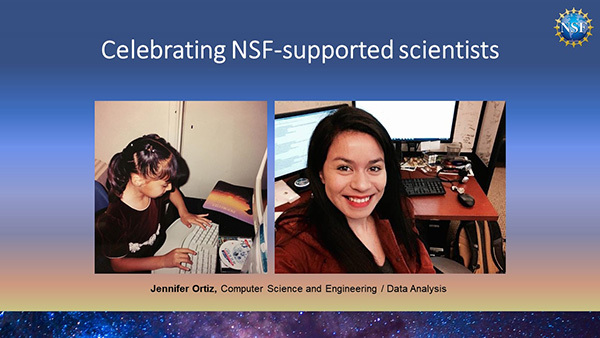 I am proud to work at NSF with some of the best and brightest researchers driven to tackle some of our greatest challenges. Every step of my journey has been rewarding and challenging, and that's what attracted me. And along the way, I've gotten to study the cosmos with telescopes all over the world and even in space, teach astrobiology, and use my English degree. So now you know more about me and where my love of science has led. As I look out at all of you, I wonder where your interest in STEM might lead you. Like me, some of you may love the outdoors. Many of the natural treasures we have here in New Mexico like Ghost Ranch or Tent Rocks have been studied by geologists, who explore how the Earth's surface is shaped or by paleontologists and anthropologists, who study the remains of life to tell us about who we once were. Perhaps you have a passion for animals � I don't have to tell you how important veterinarians are to keeping our pets healthy and happy or how much we rely on biologists to help us protect all the precious life forms we find in nature. Maybe you're a music lover. Did you know your favorite Ariana Grande song was made with the help of an audio engineer? SHE probably used a computer software called Pro Tools to turn Ariana's soaring soprano info a digital waveform that could then be balanced with the other instruments in her song. Or perhaps you love small children. Chances are, the way your parents or teachers cared for you was influenced by the work of social scientists, who help us understand how babies and toddlers learn and how they bond with their loved ones. By show of hands, how many of you have made slime!? Well, slime is basically chemistry! Chemistry is all about the states of matter -- liquids, solids, and gasses and the atoms and molecules that make them up. It is about what happens when we combine different materials and about how those materials act under various conditions. So, when you make slime by combining glue and water and food coloring with an activator like Borax, you are actually conducting a chemistry experiment! The point to remember is that you can be yourself � with all your interests and talents -- and still become a scientist or engineer. You don't have be like anyone else or pretend to not be excited or good at what you are. Be vocal! Raise your hand and let your intelligence show. Let others see that you are great at math and that you're proud of it! Give yourself permission to shine! And remember that curiosity is the beginning of all new knowledge and invention. You may discover that science is NOT your greatest passion, and that's okay. Many of the skills we learn in STEM -- like problem-solving or computational thinking -- are tools that will serve you well throughout your life and in whatever field you choose. So, keep your minds open and make the most of all you experience today! Throughout my life, I have been motivated by the many driven and dedicated people who have crossed my path. From history-makers like Neil Armstrong -- the first person on the moon -- to my mentor at NASA, Dan Golden, to the many promising University students and trailblazing scientists I have worked with over the years. But I am most inspired by you and what new knowledge you will uncover. And speaking of new ideas, NSF would really like to hear yours. 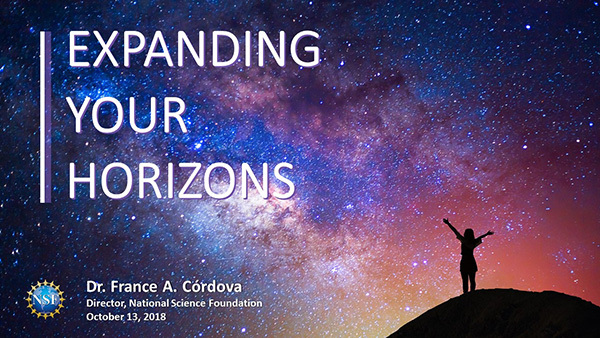 We are looking for exciting ideas for future themes in fundamental science, engineering and STEM education research that go beyond our current projects. 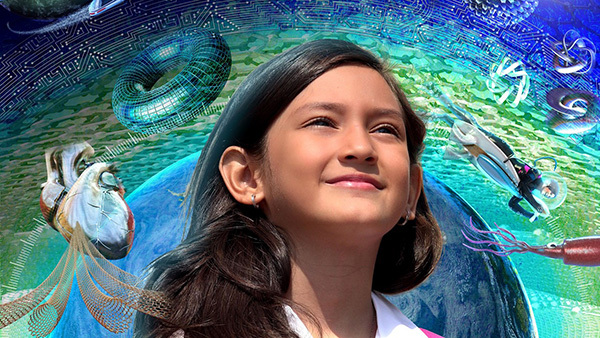 To do that, we've launched a competition called the NSF 2026 Idea Machine that challenges Americans from all walks of life and as young as 14 years old to submit bold, original ideas that will help keep our country at the forefront of discovery. 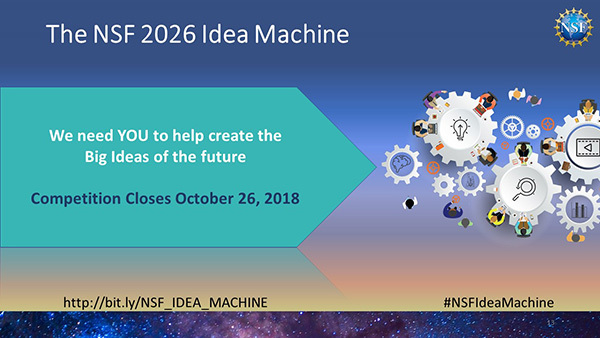 The NSF 2026 Idea Machine will accept entries through late October 2018. We are passing out cards today with our website address that has all the information you need to apply. Visit it to find our online toolkit and share this unique opportunity with your friends and family! 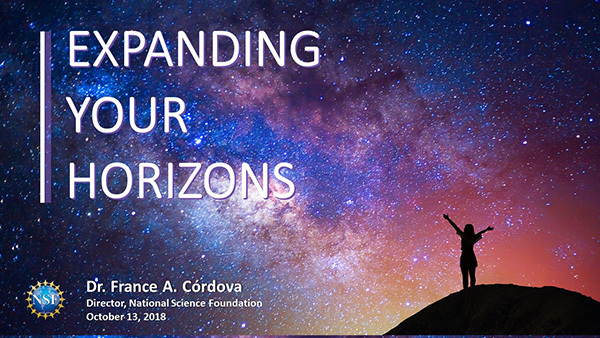 "Expanding Your Horizons" couldn't be a more appropriate title for this conference, because the first step in experiencing something new is always to envision it. That's why the lens through which you see yourself and the world is so powerful. You can imagine a future that is vast and full of adventure. You can choose to hold yourself to high expectations, to follow your passions, and to grow and develop your gifts. In front of you unfolds a path you are free to create, one step at a time, following the clues for where next to turn. Along the way, you will make your greatest discovery � yourself. And when you do, share that journey with someone special, like I have today. Thank you, again, for this time with you! I look forward to visiting some of the workshops you've been participating in and to meeting you face to face!